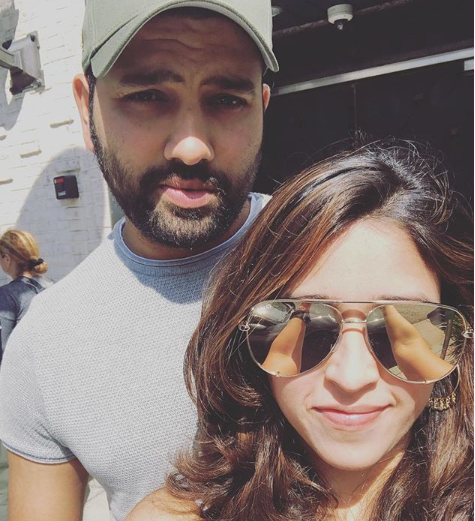 Elegant Ritika Sajdeh is the wife of Indian cricket player, Rohit Sharma. She has an amazing personality and a top level sports manager. She came into limelight when her husband scored 3rd double hundred in a match against Srilanka in December 2017. Ritika Sajdeh was born on 21st December 1987 in Ahuja Towers, Worli, and Mumbai. She belongs to a Hindu family. Her father name is Bobby Sajdeh and her mother name is Tina Sajdeh. She has a brother names Kunal Sajdeh. It was also said that Ritika is the Rakhi sister of cricket player Yuvraj Singh. She has obtained her education from Mumbai. She remains active on social media and uploads very often her pics with her husband, family and friends. Ritika like dogs very much and is friendly in nature. Robert Downey, Jr Chris Hems worth, Ryan Reynolds is her favorite actors. Her hobbies include travelling and water sports.